It has been a week of organizing, cleaning and repairing my house. We hosted a very fun event this weekend, and have a couple of other significant parties coming up, Mum is coming to stay, and it feels good to have everything in order, so we can sit back, relax and enjoy the summer – plus, there is nothing like having people over, to ensure everything that needs doing gets done. Unfortunately, the more I cleaned, the more I realized there was to clean, and we had walls, hand rails, curtain rods, and closet doors that have needed fixing for about three years, a death-trap of a trampoline that needed to be dismantled and removed, sod to be laid, gardens to be weeded, and a chicken coop door to be fixed – not that I thought anybody would be looking at those things – but I think you stop seeing it all after a while, until you have a reason to make sure your home is as perfect as it can be. As it happens, organizing, cleaning and repairing a home is rather tiring and time consuming, leaving little time to cook, or talk nicely to your family – so the quicker and easier the dish, the better. Cook pasta as directed on the package, drain and rinse under cold water. Drain tuna, reserving some of the oil in a salad bowl. Whisk lemon juice, garlic, salt and pepper with oil. Add cannellini beans and parsley, toss gently to coat with dressing. 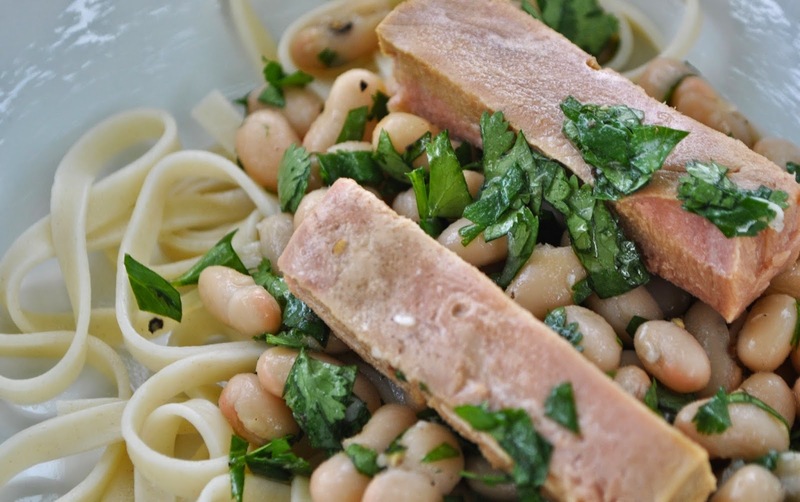 Divide linguini between bowls, top with tuna and bean mixture.